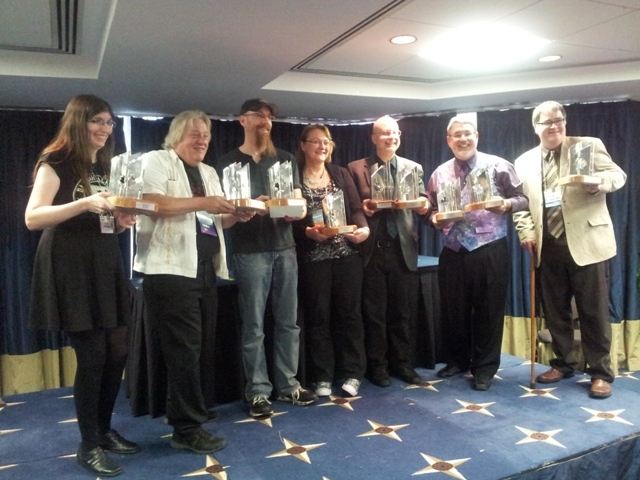 The winners of the 2013 Prix Auroras were announced in Ottawa at Can-Con this weekend. The Best English Novel winner, Tanya Huff, received a trophy and a check for $1000 from SFCanada, the Canada sf and fantasy writers association. This is her first win. In its inaugural year, the Best English Young Adult Novel award was given to Ottawa’s Charles de Lint, his eleventh Aurora nomination and second win. Robert J. Sawyer was presented with a special Lifetime Achievement award for his dedication to the promotion of Science, Science Fiction and mentoring new and aspiring writers. For over 30 years the Aurora awards have been given out for Canadian literary and fan works that members of the Canadian Science Fiction and Fantasy Association (CSFFA) feel are exceptional. Update 10/08/2013: Changed to indicate this is Huff’s first win, per corrected Aurora press release. This entry was posted in Awards and tagged Aurora Awards, SFF in Translation by Mike Glyer. Bookmark the permalink. And so it is — http://www.whenwordscollide.org/. Thanks for the correction! The winner was correctly spelled in their press release, but I copied the list from their blog to save myself formatting work and did not notice the typo online. I’ll send a note to the Aurora administrator.